SanDisk Sansa Fuze review | What Hi-Fi? 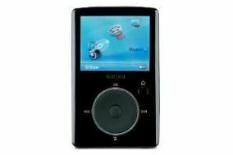 Unless you have a certain fruity logo on the back of your device, the MP3 player market is hard going. This, though, is a good offering. This Sansa Fuze player has a 2GB hard disk – there are 4 and 8GB versions available in a variety of finishes, too – as well an SDHC card slot, which allows you to increase the storage capacity. There's an FM radio and voice recorder, while you can view videos and pictures on the 2in colour screen, too. It's a sleek unit, with simple, intuitive buttons. It's a doddle to use, too, with drag and drop compatibility for PC and Mac. The interface is sensibly laid, and the responsive, fast scroll wheel helps you get about quickly. With a 320kbps version of Portishead's Sour Times, vocals are detailed and intimate, while dynamics are okay: the drums sound a touch soft and rounded-off rather than packing the punch and weight we'd like. Change the supplied headphones, and the player opens up, delivering a crisper, more precise sound. The screen is a little small for video – it looks fine but it's not on a par with the useful, larger screens offered by Apple. So, ditch the freebie 'phones, and then enjoy an MP3 player that's a pleasure to use, has plenty of features, and sounds, if not class-leading, then not too far off.